The Best Fluffy Frosting Recipe for Cakes, Cupcakes, & Cookies! Baking is a tradition in my family. My Mom was an amazing baker, I love to bake, and now I am passing this skill and passion down to my own children- teaching them how to follow a recipe and create something delicious and special from scratch. And as we get closer to the holidays, baking almost becomes a daily activity in our home. 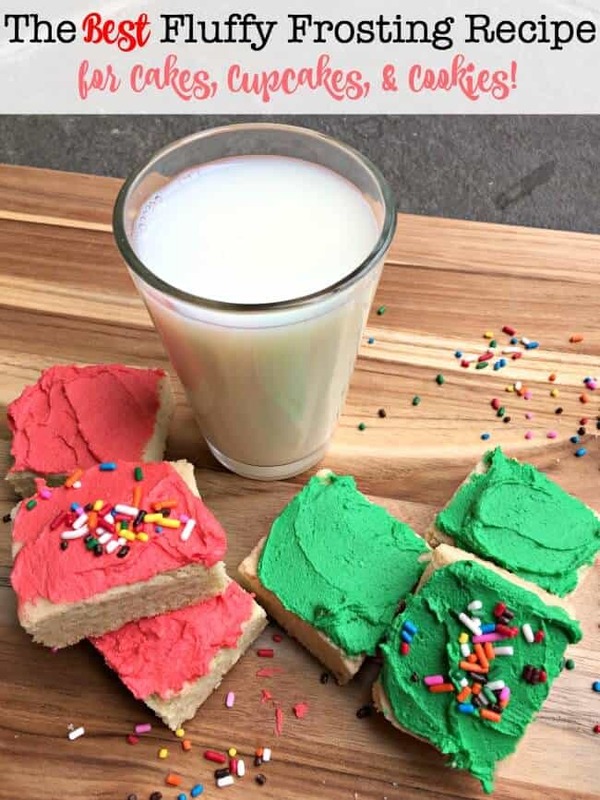 This past weekend my daughter wanted to create something new- so we took our favorite sugar cookie recipe and baked them as a bar cookie (pressing all of the dough into a jelly roll pan rather than rolling and cutting out individual cookies). They turned out beautifully. But they were lacking a little pizzazz. Something to elevate their sugary, crumbly, baked goodness to the next level. They were missing “the icing on the cake” (if you will). They were in need of my very best fluffy frosting recipe! The base of this recipe is shortening (butter is too soft for a fluffy frosting and requires refrigeration to stay “set”. Who wants to eat a cold cookie?). To that we add some flavoring- vanilla, butter, and almond extracts- before we pour in the powdered sugar. But to get this frosting nice and fluffy- the key is to beat it while drizzling in tablespoons of milk. Slowly…. so slowly…. until you get the consistency you want. Milk adds in all of the creamy goodness which makes this frosting recipe taste so good. In my fluffy frosting recipe I prefer to use whole milk, but honestly, you can use whatever milk you have on hand. 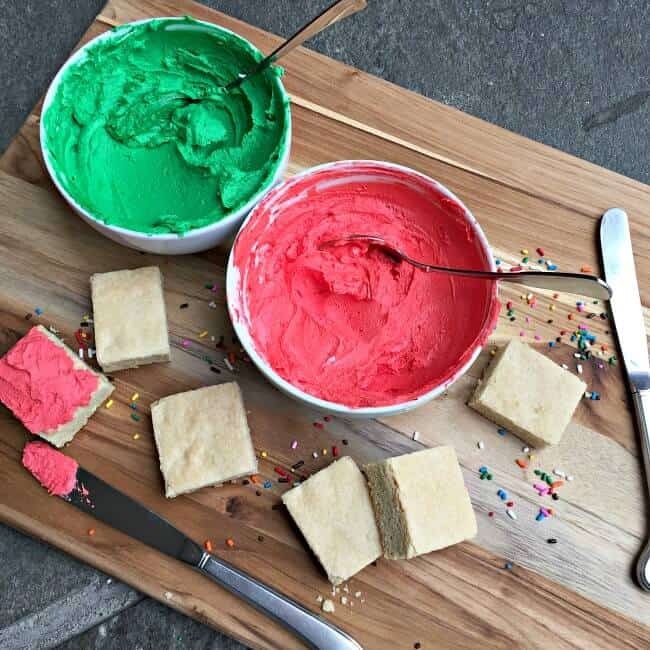 You can leave the frosting white- or add some gel food coloring to get a vibrant hue. Toss on a few sprinkles- and they look so festive! And taste so good! 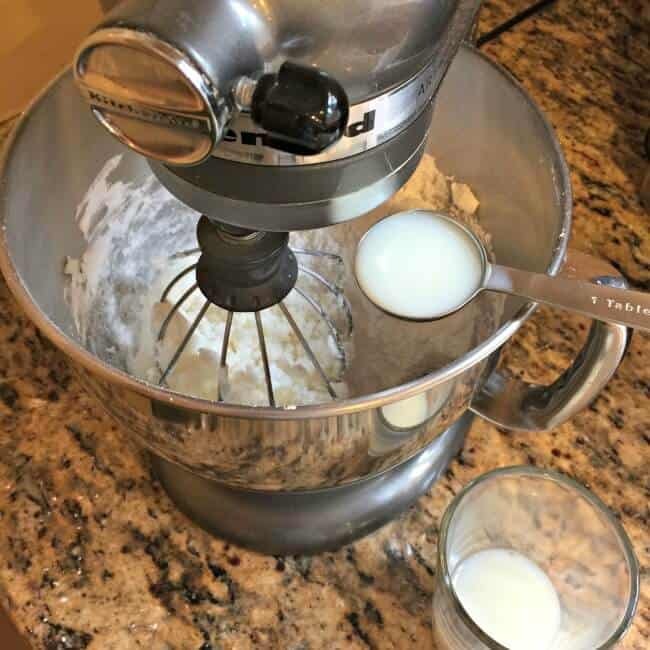 Beat together the first 5 ingredients in an electric mixer until combined. While continuing to beat, drizzle in the milk, one tablespoon at a time until the frosting becomes light and fluffy and achieves your desired consistency.